The below artworks are the most important by Robert Rauschenberg - that both overview the major creative periods, and highlight the greatest achievements by the artist. Artwork description & Analysis: Originally viewed as a scandalous swindle, Rauschenberg's White Paintings were an early codification of the artistic ideals that dominated his entire oeuvre. The White Paintings currently exist in five different permutations of multi-paneled canvases, which Rauschenberg intentionally left free of any mark of the artist's hand. By removing any gesture, the works could be, and were, re-fabricated by his friends and assistants, including fellow artists from Cy Twombly to Brice Marden. This removal of an authorial mark presaged both the mechanical appearance of Andy Warhol's silkscreened works and the slick surfaces of Ad Reinhardt's Abstract Paintings (1952-67), while also hearkening back to earlier modernist works like the monochromatic paintings of Russian Constructivist Alexander Rodchenko. The seemingly blank canvases, evenly coated in white house paint, serve as a backdrop that activates as viewers approach, coming alive with their shadows while also reflecting the light and sounds of the room they occupy. Thus, Rauschenberg succinctly allowed the "subject matter" of the White Paintings to shift with each new audience and new setting, and illustrated his interest in aleatory, or chance, processes in art, while also questioning the role of the artist in determining the meaning, or subject, of a work of art. Artwork description & Analysis: In the early 1950s, Rauschenberg explored the boundaries and the definition of art, following from the radical modernist precedent set by Marcel Duchamp's earlier Dada readymades. In this "drawing," he set out to discover if erasure, or the removal of a mark, constituted a work of art. He realized in order for the piece to succeed, he required an already notable work of art. Willem de Kooning was an established, leading figure in the New York art world when the young Rauschenberg asked him for a drawing that he could erase. De Kooning eventually acquiesced to Rauschenberg's request, albeit reluctantly. He intentionally made Rauschenberg's act of erasure difficult by deliberately choosing a heavily marked drawing filled with charcoal and pencil. Rauschenberg needed two months, and dozens of erasers, to complete the herculean task of erasing the drawing; even after he finished, traces of De Kooning's work were still present. Through the erasure of De Kooning's drawing, Rauschenberg acknowledged his admiration for his predecessor, but also signaled a movement away from Abstract Expressionism. He framed the erased drawing within a simple, gilded frame, with a mat bearing an inscription typed by Jasper Johns that identified the significance of the seemingly empty paper. The absent drawing is presented as an art object, designating the act of erasure as belonging to the realm of fine art - a typically Neo-Dada act of questioning the definition and import of the art object. Artwork description & Analysis: Another collaboration between Rauschenberg and John Cage, this print redefined the medium for the 20th century in a fatalistically Neo-Dada fashion. Rauschenberg glued together 20 sheets of typewriter paper into a continuous scroll, and laid them out on an empty Fulton Street road in front of his studio. He poured black house paint in a pool in front of the rear tire of his Model A Ford, and directed Cage to drive over the 23 feet of paper, with the front tire embossing the scroll and the rear imprinting the paper with a continuous black tire tread mark. While this work is categorized as a print, it is the artifact from a collaborative performance that explored process printing, the artist's mark, and serial imagery. While it was his idea and direction that initiated the creation of the print, Cage acted as the printer and press. 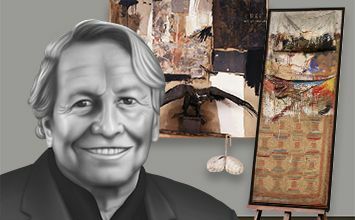 In the creation of this work, Rauschenberg effectively shifted the term "action painting" from the Abstract Expressionist active creation of the artist's mark with their own hands to the action of driving a car, part of his continued interest in the obfuscation of traditional notions of the artist and work of art. Artwork description & Analysis: One of Rauschenberg's first "combines," Bed transcends the line between painting and sculpture through its Dadaist assemblage of traditional materials and the detritus of everyday life. Rauschenberg coined the term combine to describe a series of works from the 1950s and 1960s that literally combine the media of painting and sculpture within a single, three-dimensional art object. Apocryphal or not, the legend behind the combine states that one day Rauschenberg ran out of canvas and turned instead to his bed linens, first scribbling on the pillow, sheets, and quilt with pencil, then rapidly dripping and spilling paint on them. He then stretched the bed linens over a rectangular wooden support, in the place of a canvas, and attached the pillow and quilt in a way that made it appear as if the bed was made with only one corner un-tucked. He applied the paint in a loose, dripped, gestural fashion that calls to mind the authorial marks of Jackson Pollock and Willem de Kooning. However, the brushstroke in the combine was no longer a mark indicative of the artist's psyche, but an appropriated symbol designating a shift towards the external world within the avant-garde. The found objects present more of an accurate portrait of Rauschenberg than the dripped paint, as they were items that he owned and used in his daily life, rather than an aesthetic sign borrowed from a previous generation. Artwork description & Analysis: One of Rauschenberg's most famous works, Monogram, pushed the art world's buttons by further merging painting and sculpture as the combine moved from the wall to the pedestal. While he began with traditional materials - an abstract painting executed in oil on stretched canvas - he abandoned tradition by adding an assemblage of found objects on top of the painting to create a canonical, three-dimensional combine painting. Rauschenberg often acquired materials for his artwork on his meanderings about New York City, allowing chance encounters with found objects to dictate his artistic output, and Monogram was no exception. In one of his wanderings in the early 1950s, Rauschenberg found and purchased a stuffed angora goat from an office supply store and later encircled it with a tire he encountered in street trash. He applied paint to the goat's snout in gestural brushstrokes that quoted Abstract Expressionism. On top of the canvas, Rauschenberg surrounded the goat with a pasture of more detritus strewn about its hooves - including a tennis ball, a wooden plank, and several found and reproduced images. Artwork description & Analysis: Among Rauschenberg's most iconic and controversial combines, Canyon features amongst its mixed media; pieces of wood, a pillow, a mirror, and a stuffed bald eagle. The eagle appears to emerge directly from the canvas, perched on top of a cardboard box and peering down on a pillow dangling below the assemblage. A photograph of Rauschenberg's son emerges from the incongruous cacophony of objects, boldly outlined with black above a mint green patch of paint so that it stands out amidst the fragments of printed matter. Artwork description & Analysis: While Rauschenberg was no stranger to collaged found imagery, the silkscreen technique reinvigorated his artistic practice in the early 1960s. After Andy Warhol introduced him to the photo-silkscreen technique. Rauschenberg created a series of silkscreen paintings that allowed for an open-ended association of meanings through his appropriation and arrangement of mass media imagery. In Skyway, Rauschenberg wanted to communicate the frenetic pace of American culture encapsulated in the early half of the decade, particularly as represented on television and in magazines. He stated, "I was bombarded with television sets and magazines, by the excess of the world. I thought an honest work should incorporate all of those elements." He created the work in the year following the assassination of John F. Kennedy. Kennedy was a potent symbol for change, even though he was struck down only halfway through his first term as president. The image of Kennedy appears twice in the upper half of the painting surrounded by images that illustrate the ideals of American progress in the second half of the 20th century including an astronaut, the bald eagle, and a large, mechanical crane surrounded by a demolished building. The lower half of the canvas contains a repeated image of Venus at Her Toilet (1608) by Peter Paul Rubens. The mirror within the painting expands the image into the viewer's space, mirroring the world around them as well as the world around Rauschenberg when he created the work. While the appropriated images can be read as politically and socially laden, Rauschenberg claimed he aimed to encapsulate the contemporary climate rather than comment on it, using "simple images" to "neutralize the calamities that were going on in the outside world." Artwork description & Analysis: While the space race was still in its infancy when Rauschenberg included astronauts in his 1964 silkscreen paintings, by 1969, space flight was a reality that inspired Rauschenberg, and many Americans, with the potential for collaboration between man and technology. In July of 1969, the National Aeronautics and Space Administration (NASA) invited Rauschenberg to Cape Canaveral, Florida, to witness the launch of the momentous Apollo 11 mission and granted him unrestricted access to the grounds and facilities, allowing him to explore the facilities and meet with scientists as well as utilize official photographs and technical documents. The visit instilled a renewed sense of optimism in Rauschenberg, and regarding NASA's missions, he said, "The whole project seemed one of the only things at that time that was not concerned with war and destruction." His Stoned Moon series (1969-70) is a testament to that sense of hope, particularly poignant in the tumultuous context of the late 1960s, defined by civil rights movements and anti-war protests against the Vietnam War. To create the prints, Rauschenberg collaged transferred photographs supplied by NASA. He discovered in the early 1960s that if he soaked reproductions from magazines in lighter fluid he could transfer them on to paper by rubbing the back with a dry pen nib. The imagery juxtaposes the technology of the booster rocket in red with the natural surroundings of Cape Canaveral in blue and green, echoing the sensory overload experienced as one witnessed the Apollo 11 launch. Sky Garden is one of the largest lithographs in the series, at an astonishing 89 inches in height and was the largest hand-pulled lithograph ever created when it was printed in 1969. Artwork description & Analysis: Immediately after the turmoil of the 1960s had come to a close, Rauschenberg created this collage summarizing the upheaval of the decade. While the lower left corner anchored the piece with the exhilaration and optimism of the 1969 moon landing embodied in the image of astronaut Buzz Aldrin, Rauschenberg surrounded this figure with a constellation of figures that symbolized the turmoil of the preceding decade as well. The surrounding images of John F. Kennedy, who was assassinated in 1963, as well as Martin Luther King, Jr. and Robert, or Bobby, Kennedy, who were both assassinated in 1968, highlighted the destruction of the political optimism during the 1960s. The image of Janis Joplin - a fellow native of Port Arthur, Texas - at the top right emphasized the loss of young talent in the music industry as rock stars partied themselves to death, Joplin having died of an overdose in October of 1970 right before Rauschenberg created the print. Other images surrounding the astronaut portray urban violence, the Vietnam War, and a peace vigil - all descriptions of the tumult of the 1960s. The collage structure and all-over composition further visually enhance and reflect the chaos of this period.